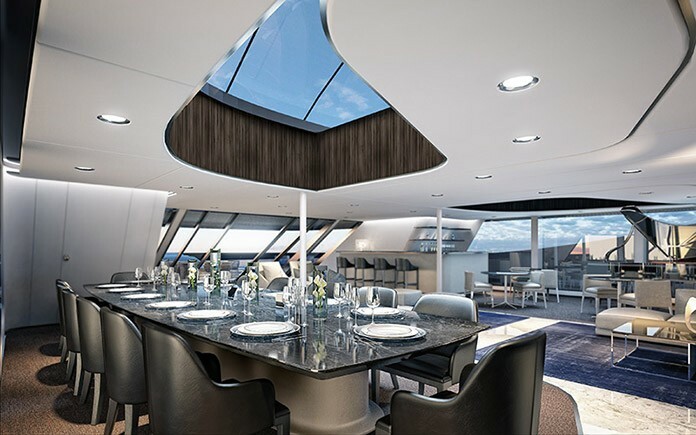 Fincantieri, leading western shipbuilding group, and Pininfarina, standard-bearer of the Italian design for 85 years, introduced the “Ottantacinque” concept of a latest- generation luxury mega yacht during the 2015 Monaco Yacht Show. 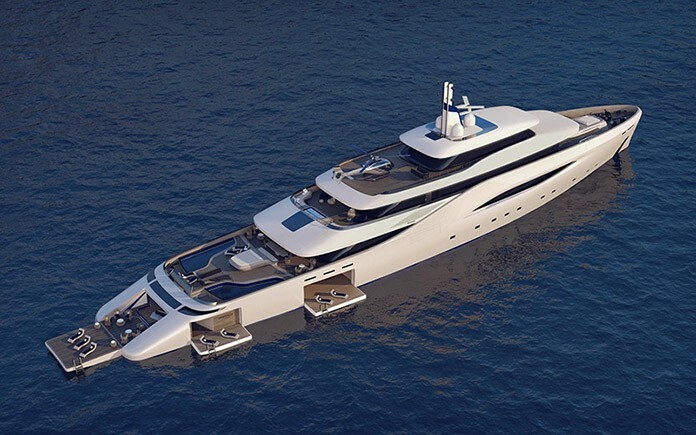 “Ottantacinque” will be a cutting-edge mega yacht, 85 meters long, 2,460 gross tons, with 5 decks, each of which featuring technological solutions and exclusive interior fittings. 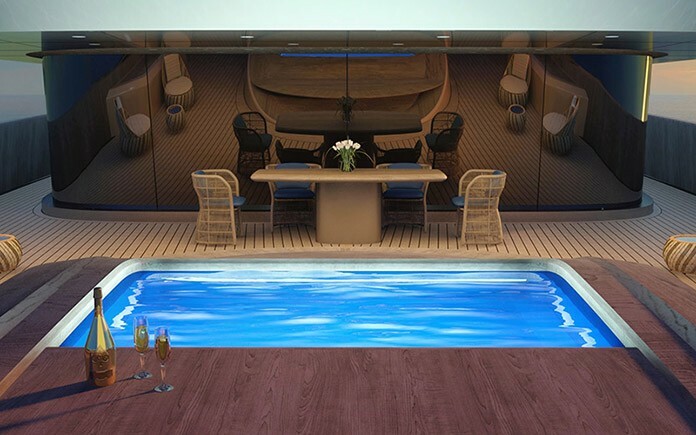 Among the most significant details the couple of twin pools on the main deck raised almost flushed with the side bulwark, which offer, together with an elevated sun bed, uninterrupted views on the sea. With the adjustable bottom, the water depth can be varied and even reduced to zero to create a large open platform spanning over 160 square meters. The entire project is a merge of simplicity and functionality, innovation and style, elements which mark the assets of both companies and which are the pillars of the idea of Technology of Beauty. 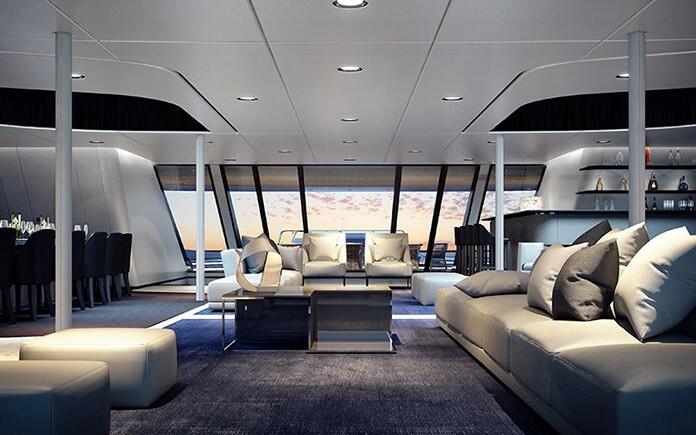 “Ottantacinque” is the ambition of creating an Italian mega yacht, technologically advanced, with essential lines, comfortable and of absolute beauty: a meeting of excellences, able expressing creativity, luxury and Italian manufacture to the utmost. After Destriero, “Ottantacinque” is the new result of the partnership between the two groups, both acknowledged world-wide as champions of the Italian industry and culture. It aims to be a strategic added value for both companies in the mega yacht segment, requiring extremely high quality and productive capacity levels. 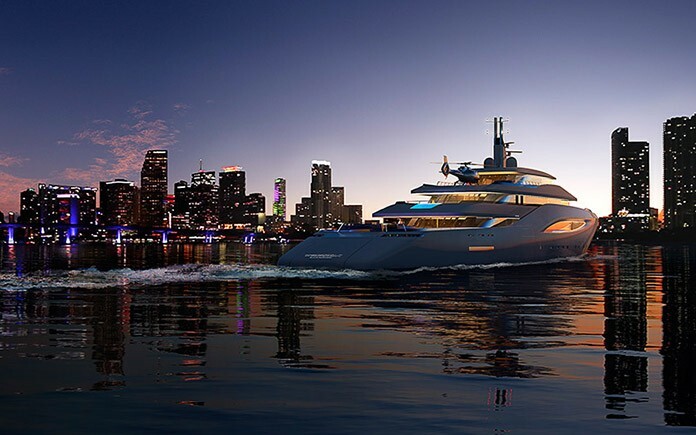 Fincantieri has channeled significant resources in this market niche, gaining important results starting from the creation of Fincantieri Yachts, the Group’s dedicated business unit. Counting on Fincantieri’s 230-years experience in shipbuilding, the company’s yacht unit offers unparalleled levels of design, style, reliability and quality in building vessels over 70 meters. The Pininfarina Group has been operating in the marine sector since the Sixties, leaving a lasting mark of its style on countless projects, from “one off” models made for special customers, to design activities of topsides and interiors for limited or wider series, both sail and motor boats, offering technical and aesthetic solutions inspired by the automotive world, which represented something original in the marine sector. Giuseppe Bono, CEO of Fincantieri, stated: “We already are among one of the few mega-yacht builders managing all the business activities, from sales to the product life cycle. Now, thanks to this stunning project, resulting from the partnership with Pininfarina, not only we enhance our position in the sector with the highest industrial level collaboration, but also we are an Italian real point of reference in a market that, as all luxury niches, highly demands the capacities and taste of our country”. 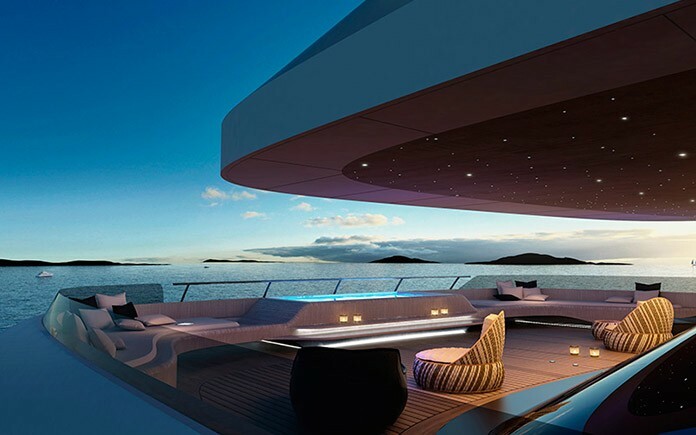 Giovanni Romano, Head of Fincantieri Yachts, stated: “We worked hard to establish ourselves on the market, thanks to the quality of the yachts we built to date, acknowledged unanimously as top-of-the-range and to the development of new high quality products which meet the needs of owners who demand boats below 100 meters. To this end we worked together with the best designers to create unique products in terms of technology, aesthetic taste and potential lifestyle on board, flexible enough to be shaped according to the clients’ requests. “Ottantacinque” is the result of an excellent teamwork, in which both our company and Pininfarina have demonstrated to be perfectly in tune while developing the concept”. “A custom-built model of the sea, in line with Pininfarina’s natural vocation in creating exclusive projects, combining tradition with innovative solutions. This is how our design team conceived the collaboration with Fincantieri Yachts” Paolo Pininfarina, Chairman of the Group, commented. 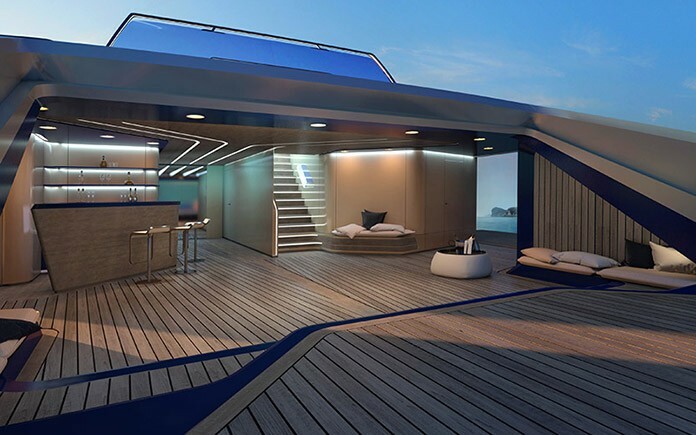 “The result is a sculptural floating home with elegant and dynamic areas, where style meets function, aerodynamics, on board comfort, ergonomics. 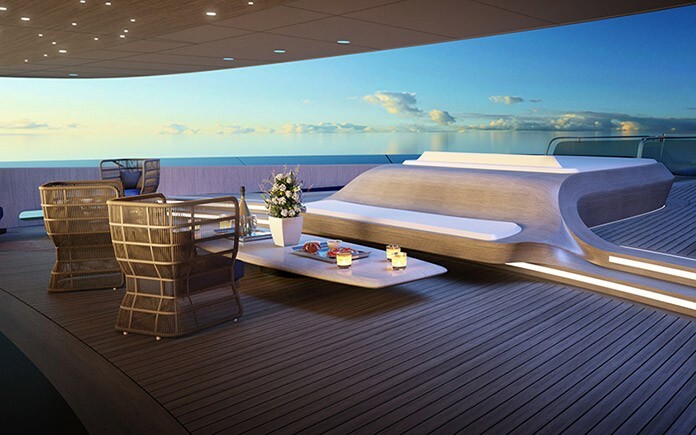 Every detail is designed to harmonize with the aesthetic theme of the yacht”.